Geo Chem provides safety testing, analysis, experiment on all the parts, components, materials and finished product. The main component of household appliance testing consist of safety, quality, power efficiency and reliability. Energy label evaluation for cookers and ovens. Security testing for oven doors. Geo Chem has the proficiency to provide all testing requirement to household appliances. We provide safety testing as per global requirements. Safety Testing: The appliance is safe to the consumer is of utmost importance. We provide electrical, sanitation, heat testing, reliability testing and service life testing. Geo Chem conducts performance tests against the standard relevant to the market. 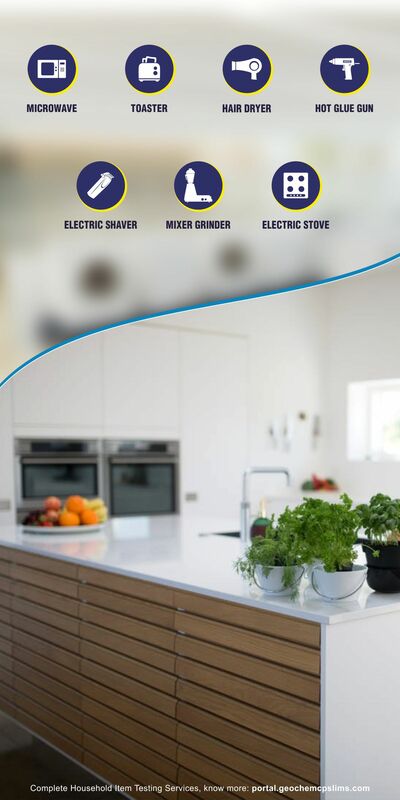 We have the competence to test all kinds of household appliances. Performance Testing provides usability, durability and functionality of the products. The environmental testing include a series of test for interpreting the correlation between product and environment. These test are performed as a component of the product safety inspection. Checking the flammability of materials and complete product. Early revelation and modification of weakness at the initial stage which could lead to breakdown during operation. Needle flame test is done in order to check the impact of small flames on household appliance. Request Now to send you Quote. We provide service at very competitive price and deliver report within time-line. GEO-CHEM GROUP, founded in 1964, is an independent inspection and testing company, with our head quarters in Mumbai and is today one of the largest and reputable inspection and testing organizations in the Indian Subcontinent.